The Archery building is where you train your rangers to level up without risk of dying to mobs. The number of students depend on the level of the building. The students require a bow to practice. They will stand on or near the glowstone in the floor/ground and shoot at the targest, a bail of hay on a fence post. The students of the Archery are not actual guards even though they will be dressed as guards, it the usual ranger clothes. They will go to their own house at night to sleep. Before you choose a place to build the Archery, take into account the distance you want it from the other “military” buildings, while it isn’t required to be near the barracks or combat academy, you may want to have a “military complex” area. After you have selected a place for the Archery building you have to craft the Archery block in the crafting table and use your Building Tool to place the building. Once you commit to the placement of the Archery hut, the block will be placed. You now officially have a Archery Hut, CONGRATULATIONS! 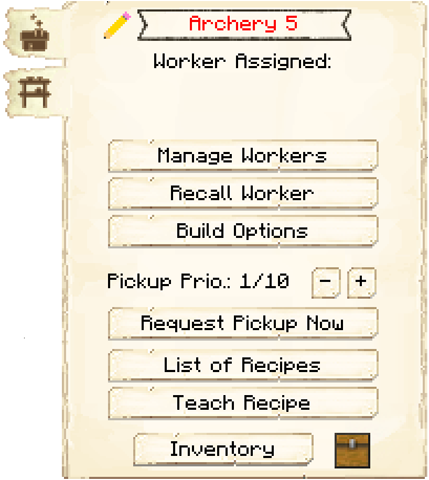 Now you will have to issue the builder the “Build” assignment so it can build the “Archery”. It will be asking for the materials it needs. Make sure to check the “chat” regularly to see what materials the builder is requesting for any build/upgrade. Hint: If you see the Builder has not finished building/upgrading your Archery and you don’t see the builder asking for any materials, go to the builder’s hut and “recall” the builder and wait a bit to see what the builder needs. Watch the Minecraft “chat” section. Also you can go to page 2 of the builder’s hut GUI and check the list of materials required, any material in the list that is still missing will be in red colored letters.